The player who played Fracture started to get sick of the relentless 90's Vigilante thing, so he decided he would play a character as different as possible. He created TINKER, an eight year old girl who's the grand-daughter of famous Silver Age Roboticist and Science Adventurer DOC TITAN. When her family vanished, Tinker was left in the care of her family compound, raised by an army of robots and her A.I. 'Mother', including TONKA, her best pal, playmate and bodyguard. As a result, she can communicate with and control robots and electronic machinery. 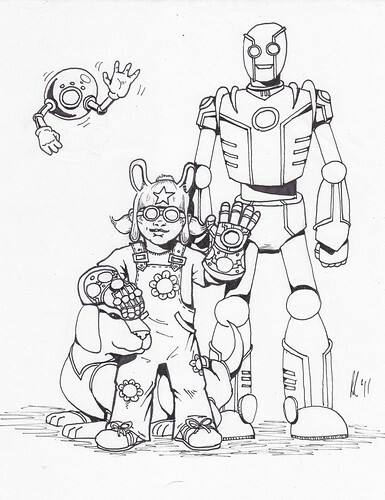 Here she is accompanied by her robo-dog, Buttons... her flying 'helping hand', Yoyo... and Tonka. 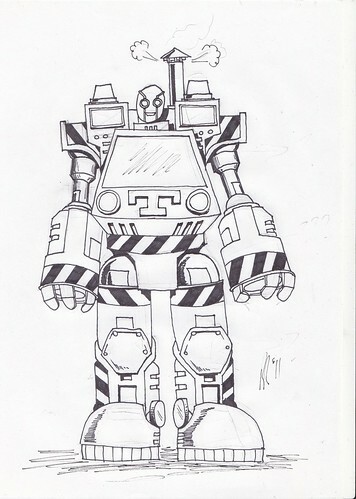 And here's TONKA in his 'Rescue Suit'. 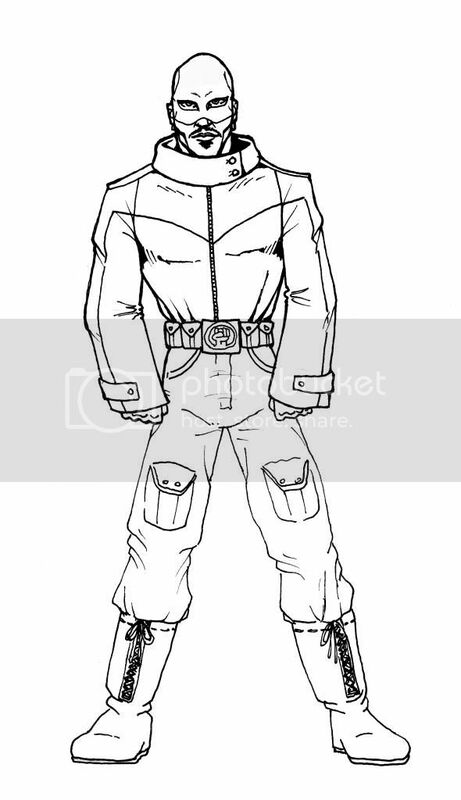 He was originally designed to be able to perform rescue operations in natural disasters. It can turn into a blimp and a truck and a helicopter! 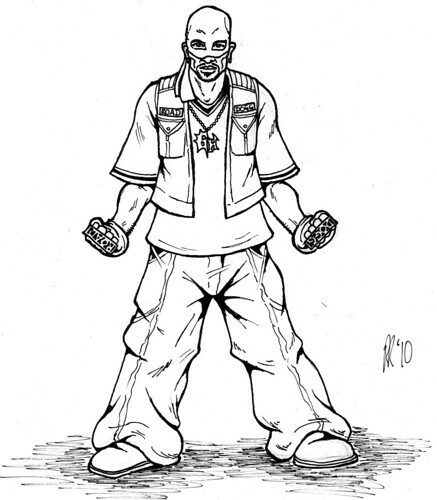 One of the characters we introduced early on was T-Dogg, one of Fracture's Street Informants, who had a kind of low-level regeneration. The neat thing with T-Dogg is that he kept slowly growing as a character. Eventually, he decided he wanted to use his ability to help people and briefly became a sidekick-in-training of Guitar Hero as 'ROAD-DOGG'. That turned out not-so-good, as Guitar Hero got distracted, with T-Dogg kind of left to his own devices. Still, he used that time to study the team's files and work out in the team's gymnasium, honing his abilities. When the heroes vanished into space for an extended mission, a mysterious figure began to fight crime in Freedom City's Lincoln area. Dubbed, 'The Lincoln Avenger', he wore a plain black outfit and mask. It actually took several weeks after the Aces returned to discover his true identity. 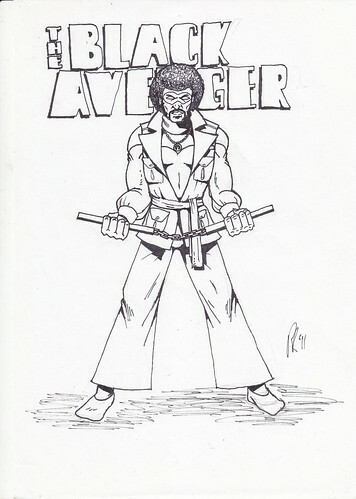 Shortly thereafter, Fracture agreed to begin training him in earnest, and he took on the name 'The Avenger' in honour of 'The Black Avenger', the defender of Lincoln during the 70's. 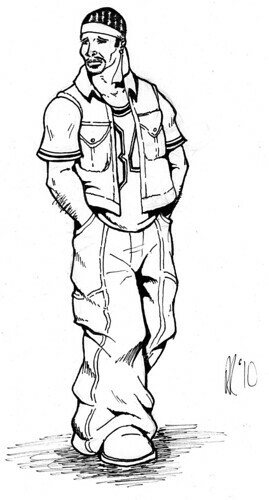 ...I had to re-design The Black Avenger. But, being the guy I am, I couldn't stop with one sweet Blaxploitation hero. 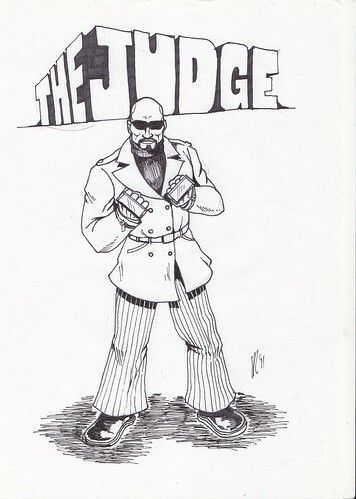 Inspired by Isaac Hayes, I created 'THE JUDGE'. 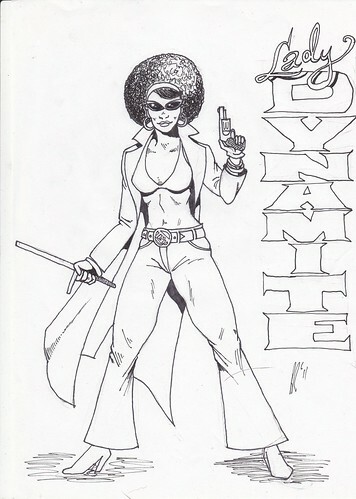 And, based on Pam Grier, LADY DYNAMITE! I was kinda proud of the backstories and concepts of those two... but I had achieved my goal... created a version of the Black Avenger that I could use as a basis for a modern version of the character... T-Dogg was now... THE AVENGER.